Too much sitting is slowly killing you, and short of getting a new job, a sit/stand desk is the easiest way to deal with the problem. 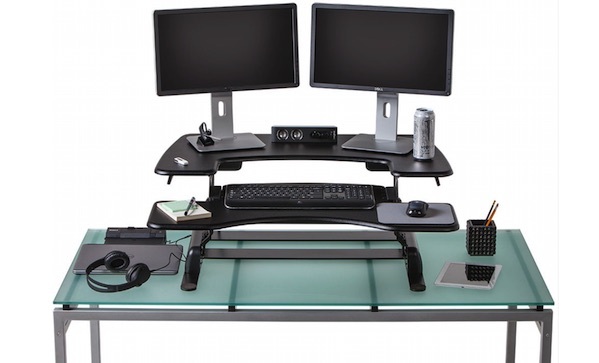 The Varidesk Pro Plus 36 ($350) will not only convert your current desk to a sit/stand desk, it’s optimised for someone with a high-tech lifestyle. It’s designed specifically with dual screen users in mind and can hold thirty-five pounds, which is probably a lot more than you need. It takes a grand total of three seconds to convert from sitting to standing, and it ships assembled.